After centuries of peace, smoldering rivalries threaten to set the world aflame in a blaze of battle! The drums of war beat, noble houses plot treason, allies become enemies, and as Lycia stands poised for war, a shadowy figure manipulates empires for his own ends. 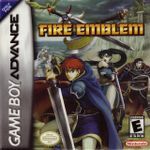 Now, Lyn, Eliwood, and Hector must amass an army strong enough to fight back the forces that would destroy their homeland. Master battle tactics to douse the embers before they burn the world to ash. Build your army! Gather heroes to your side and hone their skills in battle but guard them carefully—if they fall in battle, they're gone forever. Plan your strategy! Know your units' strengths, and guide them into the fray. Will you send your pegasus knights high across the mountains, or will your cavaliers ride to face your for at lance-point across the plains? Command the field of war! Train your soldiers to master a wide array of weapons, from swords, bows, and lances to the powerful legendary weapons Durandal and Armads. Even expert tacticians will find a world of challenge awaiting them.